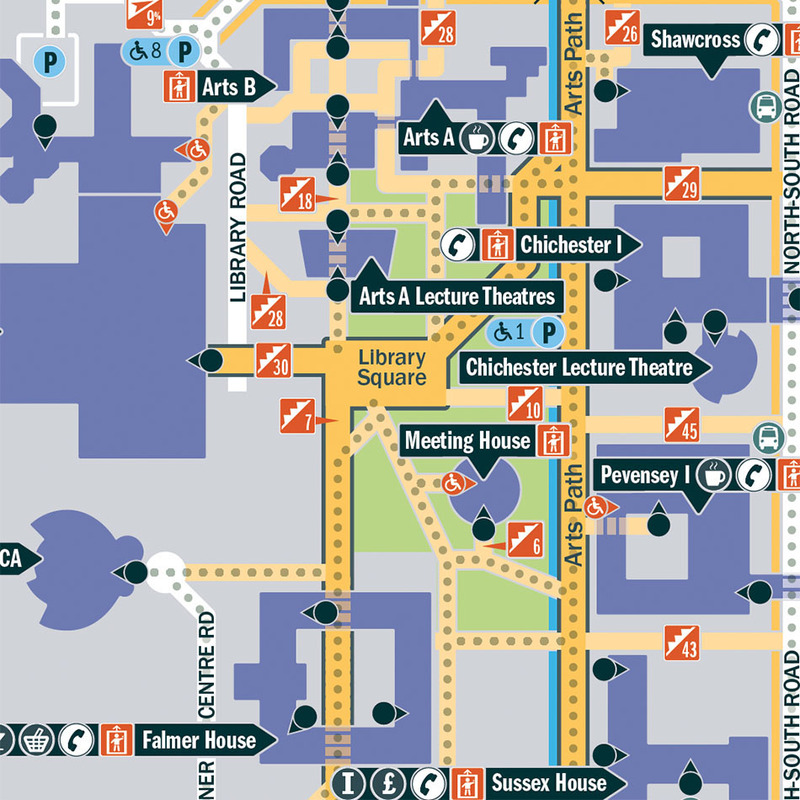 The University of Sussex needed a campus location map to help all its different user groups who visit the campus on a daily basis, navigate effectively its surroundings . The Publications and Branding Team issued a Creative Brief and invited proposals for a new mapping resource, in the form of printed leaflets, for the University website and on wayfinding plinths around the campus. Following a competitive tendering process, Lovell Johns were invited to meet with Sussex to discuss the proposed methodology and present design ideas. User groups were presented with several different options, all of whom had an opportunity to provide input on the content and style of the map. 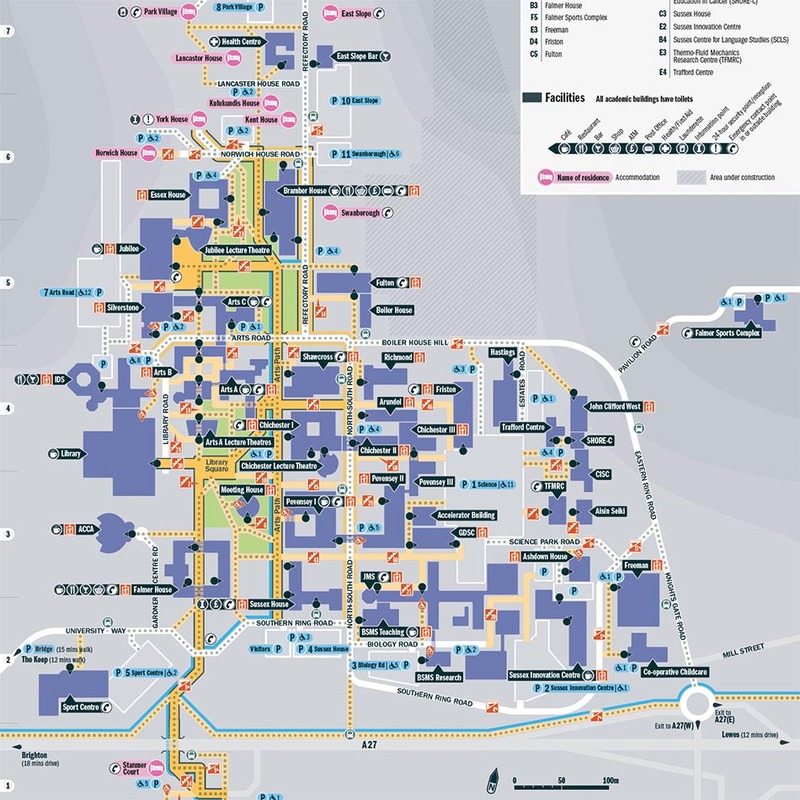 The map needed to address key issues of accessibility for wheelchair users, navigation across the campus, a useful key/numbering system and how to cope with a busy site. The commission was particularly challening as the site is located in a natural bowl with steeply sloping sides. 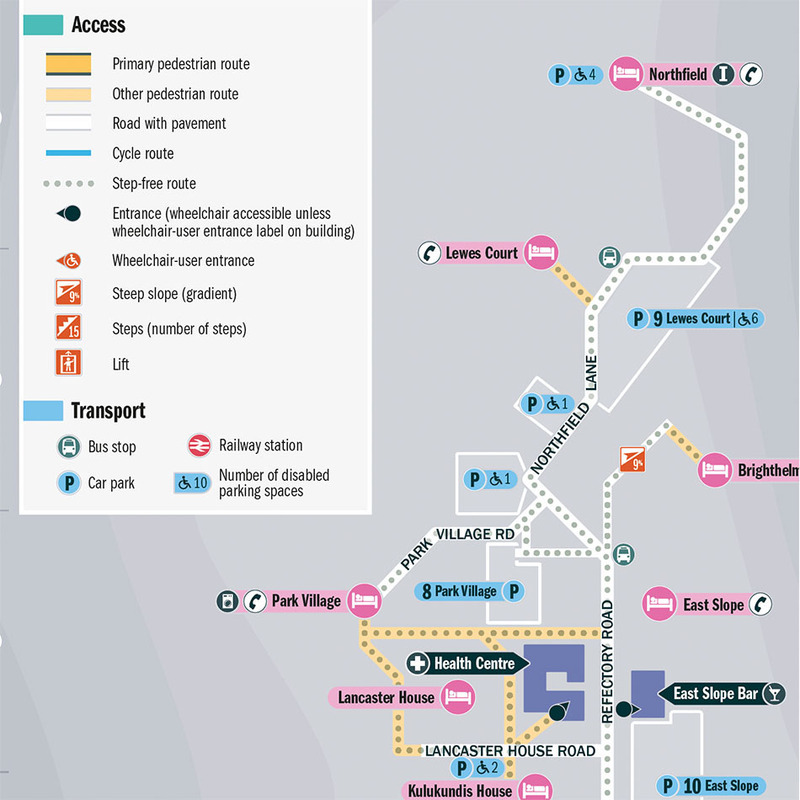 Our cartographic designer used the brand guidelines supplied by the University and incorporated their desire to have a graphic-style map, showing accessibility across the challenging site. Lovell Johns worked closely with the Digital and Creative Media team at Sussex throughout the design stages to ensure the final product was clear to read, used contrasting colours and provided a depiction of the site which is useful for all stakeholders. Lovell Johns supplied 19 different versions of the map, each with a ‘You Are Here’ marker for placement on plinths at specific sites around the campus. The map is also available on the University website. Our client at the university was very happy with the finished product and remarked that they were “thrilled with the final artwork”.